I saw this little beauty sitting on the Starfarer’s Despatch booth less than 60 seconds after entering the Worldcon Dealer’s Room. The Dealer’s Room wasn’t even open yet, but Rich and Arin were kind enough to take my five bucks anyway. Bless ’em. 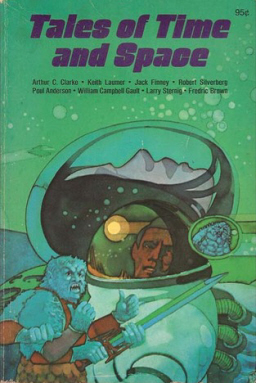 I love old science fiction anthologies. I just have to have ’em. I can tell this one is old because the Copyright Date is in Roman numerals. MCMLXIX. Let’s see… that’s 19… uh.. what’s LX again?… wait… 1969! Whew. Man, that took forever. No wonder the damn Roman Empire collapsed. Okay, I don’t know who William Campbell Gault is, but those other guys are heavy hitters. Keith Laumer’s “The Last Command” is one of my favorite Bolo tales, the one where a bunch of construction workers building a highway on a world where the last war is a distant memory awaken a dormant Bolo and it begins grinding its way to the surface, terrorizing the entire city in the process. And Poul Anderson’s “The Martian Crown Jewels” is a great slice of 50s space opera, from the April 1959 issue of The Magazine of Fantasy and Science Fiction. Tales of Time and Space was published in MCMLXIX by Golden Press. It is 212 pages in oversized trade paperback, and the original cover price was 95 cents. The stories are illustrated with occasional line drawings by Harvey Kidder, and the groovy cover is by Tom Nachreiner. Wonderful find! There’s gold in them thar old anthologies. William Campbell Gault was a fine pulpster and paperback author who wrote some fast, lucid crime and detective tales, mostly in the 50’s and 60’s. Probably best known for a series of novels about Brock Callahan, a former pro-footballer gone detective, which feature some really strong first-person prose. I don’t know of his work in sf/fantasy but I’d imagine ‘Fog’ was likely a macabre tale, more eerie than sf. Please read it and tell us what it was like! And I should have known you’d have the 411 on William Campbell Gault. We need to preserve your brain for future generations. Are you done with it yet? And did you know that legendary screenwriter Stirling Silliphant (In the Heat of the Night, Poseidon Adventure, and the Route 66 TV series) penned a half hour pilot episode for a Brock Callahan TV series? It was directed by Don Siegel (Dirty Harry). Didn’t sell, though. Love that book! I have a different edition (“A Whitman Book” from Western Publishing) which was an inexpensive hardback and (as you suspected) was marketed to younger readers. I bought mine in a dimestore in Indiana in, probably, 1969 (well, my mom bought it for me), and I still have it, in my own subterranean lair. Every story seemed a gem. A few years later in high school my one other SF-loving friend and I discovered that we both had that book and had loved it. Thanks for triggering the fond memories! > I discovered that we both had that book and had loved it. Thanks for triggering the fond memories! I always hope I’ll recapture memories for a few readers with these VINTAGE TREASURES posts. Thanks for letting me know my efforts aren’t in vain! As for the hardcover — I suspect it was the hardcover that was initially released in MCMLXIX, and the paperback followed in MCMLXXVII. If I could decipher the Latin on the copyright page I would be more confident. Glad to hear it, Arin!